*Warning: This post contains major plot spoilers about Arrival. 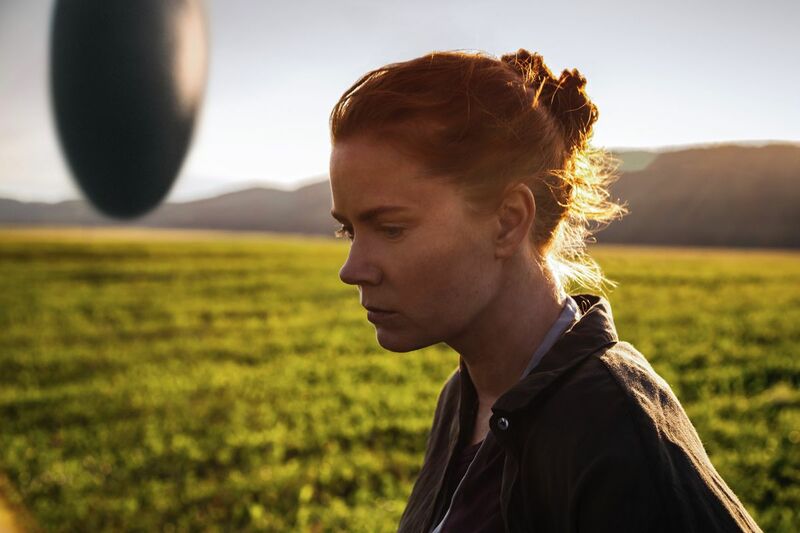 At first glance, Denis Villeneuve’s Arrival is a movie about aliens arriving on Earth. But what it’s really about is conception — about a woman and a man having a child. It’s about all the fears, revelations, joy and sorrow that being a parent brings. And, at its core, it’s about what it takes to become a conscious mother. Early in the film, twelve massive eggs descend from the ether and float in the sky, as though suspended in jelly. The symbolism is clear. Something new is about to be birthed. Which explains why it is a woman (Louise) who makes first contact, intuitively taking off her bulky contamination suit (a prophylactic covering) and approaching the “barrier” between herself and the aliens. Barriers, borders, membranes — these are areas of great power and energy, because to cross them means to penetrate and fertilize — to create something entirely new. The aliens can see the future, and they offer this “gift” to humans via their language. But there’s a catch — they’ve divided the “key” to their language into twelve parts, and given them to twelve different regions in the world. Thus, their language (and by extension, the gift of foresight) will only be fully understood when the whole world works together. As Louise, a prominent linguist, immerses herself further in the aliens’ language, she begins to have visions of her daughter, who succumbs to an incurable disease at a young age. We assume this is Louise’s tragic past, which would explain why she is living a lonely, solitary existence at the start of the movie. But the final act reveals that these “memories” are actually visions of what is to come. We realize that Louise has been glimpsing the life and demise of her future daughter, Hannah. There is more to the plot — suspicion foments fear and humans come close to waging war on the aliens — until Louise uses her newfound ability to see into the future and convince the military chiefs that the aliens mean no harm. Humanity is unified, and the aliens leave. In the midst of all of this, Louise and her new colleague, Ian, fall in love. But, the question remains — what will Louise do? Her life spreads out before her. A potential husband (Ian), a potential daughter (Hannah), and certain pain and suffering (Hannah’s death). Will she move towards motherhood in spite of the risks? At this point, Louise asks Ian, “If you knew your life from start to finish, would you change things?” Well, we already know the answer. Because we’ve seen, from all the fragments of her future, that Louise has her baby girl even though she knows her daughter will die young. Arrival is about how we plan the arrival of our children — how we create a space for them in our consciousness, even before we conceive. And to do this responsibly, we must first arrive at ourselves, and understand that Time — our past, present, and future — is all linked. What happened to our mothers and fathers affected us, and what happens to us affects our children, and so on. With that knowledge, we can clear away our psychological baggage, so that our children have a chance at true autonomy and happiness. Louise faces possibly the worst possible scenario — outliving her own child — and yet she accepts her fate. What can we extract from that? Some pro-life message? I don’t think so. This goes much deeper. Louise’s choice teaches us what it really takes to become a Conscious Parent. First of all, to be a conscious parent, you have to face some truths about your own parents. If you think your parents were perfect, then you’ve got some serious work to do, because no one is anywhere near perfect. Science and history show us that stress, trauma and lack of attachment during pregnancy, however unintentional, impacts a child’s health and well-being well into adulthood. This gets compounded in infancy and early childhood if the child’s parents are overwhelmed, distant, angry or neglectful because their own emotional needs aren’t being met. Once we accept that we had less-than-perfect conditions early on, then we can approach parenting with sober awareness. Because the truth is, conscious parents are faced with a huge challenge — to give their children what was not given to them. There is no harder job in the world than raising a child with unconditional love when there is, frankly, a deficit of love in the world. A lot of us have never experienced unconditional love. We don’t know what it is. So how can we give it to someone else? The answer lies in a fundamental change in humanity. At the end of Arrival, Louise finds herself at the center of a new world order in which a universal language binds humanity together. This peaceful state is an ideal environment for making babies and a sorely-needed foundation for becoming a mother. And this is why Louise is able to have her child, and love that child, even though she knows it will end in terrible pain and sorrow. Because humanity has her back. This is the kind of enlightened world we want to forge for our mothers-to-be, one in which all women are supported, respected and understood. A world in which love is no longer in deficit. A world in which mothers and fathers have enough love for themselves that they can love their children unconditionally, from the moment they are conceived, and even before. No matter what the future may bring. This is the “gift”, a new consciousness if you will — the ability to see our future children and fully commit to them before they come into being. For humanity’s fate lies in its conception, even in its pre-conception. That’s why the aliens’ written language looks like cells, and clusters of cells — zygotes and blastocysts. And that’s why it took a woman to decipher its message: When we are loved before we are conceived, we thrive. Louise was indeed sad in the beginning of the movie, but then she found connection, and so did the rest of humanity. With the gift of foresight, and with humanity at her back, she was able to become a conscious, loving mother.